We did the satisfaction survey in all patients who had their vasectomies in 2016-2018, Here is the ratings summary based on 223 responses. 5 stars in almost all categories! •• Easy as apple pie. recommended for anyone. •• I dragged my feet for 2.5 years even though we both agreed that our family was complete. I listened to music during the procedure which only took 9.5 minutes (yes I timed it). Dr. Shu did an awesome job! I didn’t feel anything (even the anethesia) during the procedure. I had very little post op pain and no complications. I even went to work the next day. Today I had my analysis and they had my results back within 30 minutes. I had a bad experience at my first consult with a urology group but am thankful I ended up here. •• Dr. Shu was friendly, made the procedure comfortable and his facility was nice. •• Just left Dr. Shu’s office for the ezvasectomy procedure. I’m sure glad I went this route vs the traditional operation. I was a little nervous to go in and have this done, but was actually easier than going to the dentist to have fillings done. The procedure was very short lasted about 8-10 minutes. The application of the numbing agent was nothing at all. I did feel slight discomfort and slight tugging when the left side was being worked on. I’m actually laying down on the couch after driving myself too and from the appointment. I do have some discomfort, about a 2 on pain scale, feels like on lower abdominal area, but I have taken zero drugs for pain and no ice. I would recommend this procedure to every man thinking about getting snipped and Dr. Shu and his staff as the go to place! They were so wonderful, professional and comforting. Great place, great staff! Thank you! •• Excellent experience. 5 stars! •• A month out since I had the procedure and I can say I have not had any issues. I had a little discomfort right after the local anesthesia wore off but since then nothing to complain about. The staff was great and it took less then 10 minutes!!! •• 5 stars! Hardly any pain during procedure or after. •• This is super easy and painless. The opening order re-open every time I would pee though. It was not a big deal but I got too worried about it so I didn’t drink enough water and ended up dehydrating myself. I think this led to some complications and I didn’t feel recovered for at least three weeks. They were quite good about helping me during this time as well. Moral of the story is do not be an idiot. Drink a lot of water afterwards. The opening may reopen when you pee, but it will be fine. •• Everything went smoothly – was very pleased with everything. The procedure and after-care is not without some discomfort, but I felt it was drastically minimized because of the great care taken by the doctor and the staff. Thank you! •• The Male thing that starts with ”V”, Doc did a great job, no pain at all including recovery. I guess there aren’t many reviews on here because people don’t like to talk about stuff like this — I really don’t care, so Here we go — the worst I felt was about the same level of ”awareness pain” you might have a few weeks after you have sprained your wrist or something, and it has stopped hurting — but you are still quite aware that if you move it or put any stress on it that it will hurt, but it doesn’t at the moment. The entire experience was good, I called about a week out, he got me an appointment (no consult, just watch a video and read the instructions), the day of I was out the door about an hour after I walked in. I paid with some saved up HSA dollars, no need to worry about deductibles etc. (I hadn’t met for the year yet anyway) and got a 10% discount off an already pretty reasonable fee. •• It was super easy to get scheduled and taken care of. The procedure was quick, easy, and painless. After care is easy and I felt like I could reach back out for any questions I might have. •• Physician should not ask me questions about the border crisis when he has my balls in his hands. (Most men are nervous about the procedure, and Dr.Shu is very good at distracting the patients). •• Everything was pretty fantastic except I had to wait for over an hour past my appointment time before I was called back. (Very occasionally, Dr.Shu was doing the big surgery longer than estimated prior to his vasectomy , we apologized). •• I’m in business for myself and I do follow ups with my customers after I’ve completed work for them. There wasn’t any follow up after a day or two or three. A note to see how the pain was, make sure your resting etc. I’m not complaining about any of procedure during or after, merely helping to improve. I was impressed that I had emailed a question using the website and Dr. Shu readily responded, even after hours. (All instructions were given to our patients verbally, in writting and online, Dr.Shu is available to answer any questions from our patients at any time. The no scalpel, no needle, no suture, vasectomy has rare complications with quick recovery, the patient just need to take easy for 2 days, so we usually don’t disturb our patient by calling them). •• Doc was informative and procedure was quick and easy. 7 min surgery and that was it. •• First I want to start with saying how great my experience was at your office. The procedure went fast and painless. Dr Shu was quick but did not seem to be in a hurry or rushing. He was calm and answered my questions. I enjoyed the chit-chat with the receptionist. She was very polite and accommodating. •• Not a lot of communication after op. This survey is too vague. I barely even saw the Dr Face. Seems like everything went ok though. Not a complicated procedure so I guess post follow up isn’t really needed. The pain was less than I expected. •• Had I realized it was this easy I’d have done it long ago! Thanks! •• 5 stars! the only negative was that once in the room on the operating table I had a very long wait that was uncomfortable. (comment: occasionally, we had very busy days or needed to take care of more urgent cases, we were sorry about that). •• I highly recommend Dr. Shu and the EZ Vasectomy. It is refreshing to have a clinic that takes the patient experience into consideration. Everything from scheduling, to the follow up sample testing is done in a way that puts value on my time and makes it easy for me. Not to mention I received a consultation from a urologist before I saw Dr. Shu. They recommended general anesthesia that would have come at a $6,000+ cost to me plus the extra recovery time from the more invasive procedure. Dr. Shu was able to complete the procedure in 7 minutes with local anesthesia at 10% of the cost. For the recovery, I was able to function like normal, just took it a little easy for 2 days. I wouldn’t even call it a painful recovery. A sunburn is more painful than the recovery I experienced. •• Called a few times post procedure, always happy and reassuring. 5 Stars! •• Very happy with the service. •• Five stars. The jock strap that was given to me was too small. I’m 5’9 at 235lbs. If your bigger make sure you ask for a bigger one. •• Super easy and convenient. Very professional. A+ all around. •• It took me 3 years to arrive on the decision to have this procedure done. I have somewhat of a fear of medical procedures. I read all the testimonials of previous patients and still waited a while to make the final decision. Once I arrived on the final decision it was very easy. I scheduled the procedure (through online registration) without needing a (face to face) consultation (in my case). When the day finally came my wife drove me in, I signed a few sheets of paper, paid, and was out of the procedure in less than 10 minutes. Dr. Shu was very professional, explained exactly what was happening, and was very clear on what I should experience after as well as clear on direction to follow for proper care and healing. My wife and I are completely active again and very pleased with the results. •• Dr. Shu was great! I was very nervous and he was as gentle as could and caring as can be. • All of my questions and needs were answered and accommodated to my satisfaction. Both the staff and Dr. Shu were very easy to speak with and very helpful and considerate of my needs. I would highly recommend this procedure and Dr. Shu and his staff to anyone seeking this procedure. The procedure was completed in 6 minutes! Amazing! •• Doctor was super quick I was in and out in 15 minutes. Only had a small pinch when he did my left side. Took me about 3 days to recover to a point where I could comfortably walk around. •• The procedure was very quick and easy. Only took about 5 mins. I would recommend that if you have a physically demanding job that you take extra time off to recover. I went back to work after 4 days and I felt good, but I ended up with a few complication because I was not healed up enough for strenuous activity. The doctor and staff were great with any questions or concerns I had. I would recommend them for this procedure. •• No swelling was nice and made for a very pleasant next day as I walked a lot of steps and the state capital. I would highly recommend this procedure to anyone considering a vasectomy. •• Procedure went very well. Dr. Shu is awesome! Would recommend to all my friends seeking this procedure! No complications after the procedure. •• This whole experience was absolutely painless, I don’t know what they could do to make it simpler. •• Super fast and easy, wish I would have done it years ago. Thank you. •• Dr. Shu was very gentle and quick. I mean I walked in the room, procedure was about 7 minutes and I walked out with zero pain. Clear post vas care instructions and no follow up needed. One day in 7mins and back to work, done! Excellent service and great new pain free procedure with 99.9% sterile rate! No more pregnancy worries! •• The procedure wasn’t that bad. When Dr. Shu did the madajet it felt like being pricked when you go donate blood but just down there. The left side was more sensitive and did hurt a little bit. They want it nice and shaven. What I used was veet sensitive. Caked that on down there and the hair came right off. I was even complimented on how clean and nice of a job it was. Sure beat using a shaver down there. After the procedure, I actually walked around the MOA for an hour with the wife. Was a little sore but Tylenol and ibuprofen helped. Never iced them. It’s been a month after now and every once in a while the left side will hurt for a few seconds. Maybe over working myself and trying to bend straight picking up tools and what not does not feel too good so bend the knees and don’t bend like you’re trying to touch your toes. Otherwise everything went good and just waiting for everything to come out clean so my wife and I can really have fun without worrying about kid #4. •• I have friends that chose the “traditional” vasectomy and didn’t have a good experience. I was very nervous about this procedure and Dr. Shu and his staff really did a great job of walking me through each step in the process. My experience went great! Little to no pain, quick procedure (could of left the car running) and no down time. I would HIGHLY recommend this procedure with Dr. Shu and his staff to anyone!!! Thank you all for making this such a positive experience!!! •• When I booked my vasectomy with EZvasectomy.com, I wondered if I was making a mistake by booking a sensitive procedure with a doctor I had never met. Then I went ahead with it anyway, and I’m glad I did. Not only does EZvasectomy offer the latest painless techniques and the most affordable price, the entire experience is impressive. Dr. Shu is experienced and professional; he did my vasectomy in under 6 minutes! •• It was easy for me to get my vasectomy done out of state, because I did not need to come up for a consult, or a follow-up. When you book your appointment, you’ll receive information about the procedure that will help you feel completely prepared. I’m so glad I was able to save a lot of time and money by going with EZvasectomy. I’m also pleased that I got my vasectomy done right before March madness, so I have a reason to sit around and watch the games! •• Dr. Shu was great! My wife and I collectively agreed that I would undergo the procedure, and I’ve got to say that it couldn’t have gone any better! I was slightly nervous when I entered the office, but the moment I met Dr. Shu, he was so personable, that I immediately felt at ease. Since then, I have been recommending Dr. Shu’s services to my friends, as well as friends of my friends. I’m all healed up, and I feel great! Thank you, Dr. Shu! •• Dr. Shu and his staff were awesome and the procedure was easy fast and simple, I would recommend this office to anyone. •• The surgery went great. Dr. Shu was very experienced, and did a good job keeping me calm, as I was a bit nervous. The healing took a bit longer than I thought, just over a week before the pain had completely subsided. •• I recommend this procedure to anyone needing a vasectomy. It is quick and painless. Dr. Shu is very personable even through the procedure to keep your mind on other things. It took a little over two weeks for everything to heal up, but this is normal. I highly recommend this to anyone! •• Dr. Shu was amazing and made the experience very easy and comfortable. 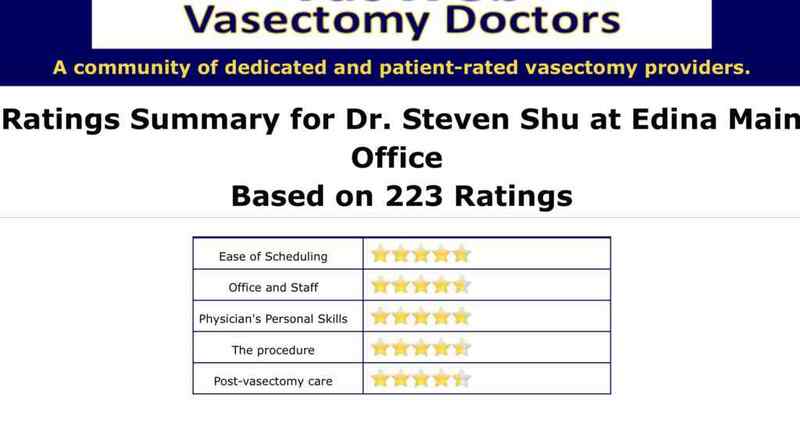 I would recommend that anybody looking to have a vasectomy go see Dr. Shu! •• Dr. Shu was very skilled and friendly. Would definitely recommend! •• The procedure was a breeze. Virtually no pain! I would highly recommend this procedure over the conventional approach. •• Went well. Had a little pain during procedure. Was out for a few days and took it easy at work the follow week. •• Did not have any need for post care. •• This is the exact type of experience I had hoped for previously, but had not received. I was not looking for a consult or counseling, I just wanted the procedure to be done. The provider asked all the right questions to make sure I was sure I wanted to get the procedure done and did the procedure. Total time spent in the providers office was less than 30 minutes. Recovery was easy and pain during the procedure and during recovery was minimal. I am very happy that I found this solution. •• Very quick and easy procedure. I highly recommend Dr. Shu. •• Overall great experience! Easy scheduling, excellent communication and follow-up. Nice facility with friendly staff. Dr. Shu was very professional, careful and thoughtful. Nearly painless procedure and far better than expected post-procedure comfort and recovery time. I highly recommend Dr. Shu! •• I was pleasantly surprised. I expected lots of post procedure discomfort. I experienced minimal soreness. •• I was very nervous about having the procedure done but Dr. Schu was very professional and put me at ease. There was literally no pain whatsoever and the recovery time was very quick. I would highly recommend his services. Also the office was very warm and inviting and the staff were very friendly. •• It was a piece of cake. I was so anxious up to and most of the way through the procedure, but it was done quickly and as easy as I hoped. •• Amazing should have did it years ago. •• It was a breeze! 7 minutes and I was in and out. Very little pain, and after taking it easy for a couple days I was right back into my regular schedule. Highly recommended! •• Should of done this sooner! Very fast, easy and painless. •• The procedure was fast, convenient and the pain was minimal (less than I expected). Happy with the decision to chose this procedure and this Dr.
•• Had a little more pain post-vasectomy than anticipated. And occasional pain a couple times in the few weeks after the procedure. Otherwise it went well. •• I found I was worried over nothing. It was minimal discomfort and even that was completely gone after a week. •• The procedure was very quick (20 minutes from the moment that I was called in until the moment that I walked out). There was virtually no pain at all, and within 4 days I was completely back to normal. I would highly recommend this procedure and Dr. Shu to anyone looking to have a vasectomy. •• I am very pleased with the procedure! It was as easy as 1,2,3 . •• Everything was real good except having to wait 30 min. past the scheduled appointment before getting in for procedure. •• Very easy procedure. Thanks to the staff for calming my nerves. •• I have recommended the office to several friends. •• I would highly recommend this type of vasectomy. A quick procedure,with very little pain and a fast recovery. •• Any fears about pain, mishaps, or the procedure were unnecessary. The entire experience was far more easier than I had anticipated. I highly recommended your clinic for anyone considering a vesectomy. Thank you. •• This was as easy and painless as it could possibly be. I also saved a TON of money over going to my regular doctor’s office. I am very happy with my decision.